Key logger is surveillance tool that records and traces typed keystrokes on your home or office PC. Efficient KeyLogger utility captures keystroke activities including text document, send emails, visited website, instant messages and saves all the information in encrypted log file. The software provides facility to send recorded log file to user specified email address. Keyboard activity recording tool gives you full control on your PC and invisible from Windows environment including Start menu, Add/Remove program, Desktop and even hides software installation files from the external users. Computer monitoring application is password protected to prevent unauthorized user from starting/stopping the software process as well as changing and modifying software configuration settings. 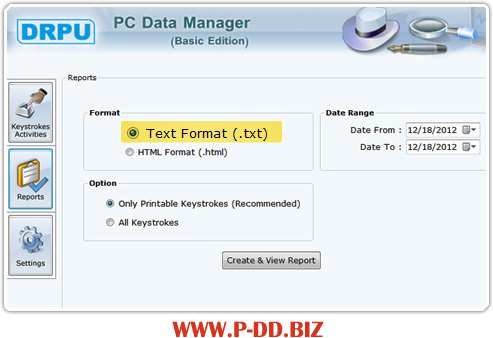 Traces and records typed keystrokes including document list, send emails, search engines, instant messages, visited website and other PC keyboard activities. Save all the activities in encrypted log file with option to send log to user predefined email address. Software runs in Standard or Hidden mode. Run in invisible mode and not detected on Desktop, Startup menu, Add/Remove program list and Software installation files. Facilitate to set hot key and run command to access the software if it’s running in hidden mode. Generate reports of recorded data in txt and html file formats. Password protected utility prevents external users to change or modify software configuration setting. Provide easy to use friendly graphical user interface.